Coding burns takes more information than you might realize! Most scenarios require these following key components to tell the details of the condition–site, severity, specificity, and extent. This session will help you utilize each of these elements to choose the right code. We’ll start with how a burn is defined, then how to determine the degree of the burn, how to utilize documentation to get the exact specificity required for appropriate reporting, and what conditions can be associated with burns. 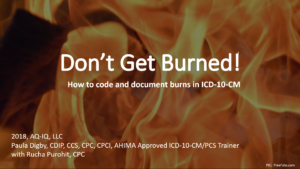 We’ll take the guesswork out of how to list the burn codes in order on the claim, along with how to code for any subsequent infections and burn sequelae. Confused on how to calculate the percentage of body affected by the burns? You’re not alone. This presentation will address just how this is calculated in a way that’s easy to remember–so that you can code burns with confidence! Accurately determine the site, severity, specificity, and extent of burns through the documentation. Correctly order the burn codes on the claim form. Calculate affected body surface area percentages.